OK, so sometimes when we writers at GeekTech joke that robots will make us obsolete or make it sound like they could take over the world, we're being a bit facetious. However, videos like the one below do not help matters. 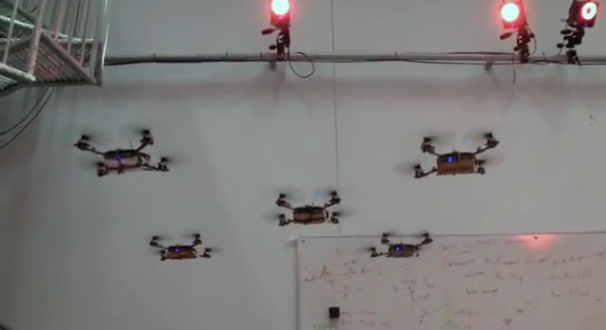 Researchers over at the University of Pennsylvania's GRASP Lab have managed to get their Nano Quadrotors robots to fly in formation with incredible precision. Previously, these little flying robots were able to swoop in and pick things up or fly through small gaps, but now they are able to fly in perfect swarms. Place one of these bug-like robots with others, and they will all fly in tandem with each other. They don't just fly side by side, either--they are capable of complicated (but impressive) pattern displays. Nano Quadrotors are also good at straightening themselves out after being thrown into the air, and even return back to their master. It will be interesting to see what the likes of GRASP Lab and other researchers do with Quadrotor swarms--maybe these could be developed to videotape events from above, or to assist with building construction. Or perhaps, just to freak people out.